TORONTO, Oct. 2, 2017 /CNW/ - Treasury Metals Inc. (TSX: TML) (OTCQX: TSRMF) ("Treasury" or the "Company") is pleased to announce results from its recently completed 4,360 metre condemnation and exploration drilling program at the Company's flagship Goliath Gold Project located in Northwestern Ontario. The condemnation program drilled several areas where future mining infrastructure will be situated, including milling and mining operations, and is encouraged by a number of new near surface intersections northeast of the proposed open pit. The first drill results from the Company's active infill drilling program are expected to be announced in October. Gold mineralization was intersected in several drill holes approximately 80 to 350 metres from the proposed open pit. Due to the proximity to the proposed open pit, these and future drilling results, may lead to an eastern expansion of the pit and/or underground operations ("East Resource Target"). 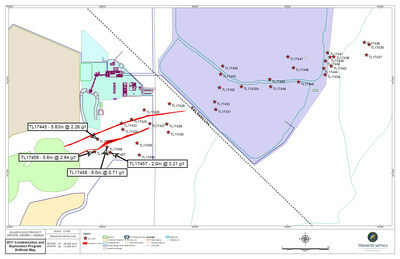 Chris Stewart, President and Chief Executive Officer, commented: "After completion of the current infill drilling program in the Main Zone resource area, this East Resource Target will become an area of focus with plans to drill test down dip and along strike to further delineate this exciting target. The additional drilling in this zone has the potential to add near surface mineral resources which may potentially extend the mine life and/or increase production rates from the underground when compared to the proposed mining schedule in the 2017 PEA." All results from the program will be available for viewing in the Complete Assay Table on the Company's website.